Noida: Indo Hungarian Film And Cultural Association of International Chamber of Media And Entertainment Industry has been involved with the promotion of Hungarian Cinema and cultural in India continuously from last many years. “We leave no chance to grab the opportunity to high light Hungarian artists and plan immediately shows for them. 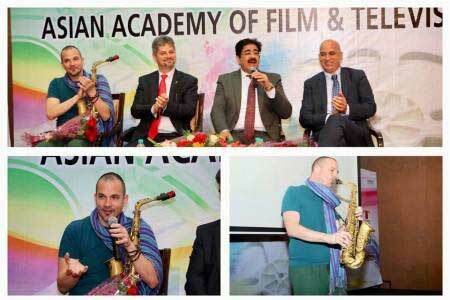 This time renowned saxophonist Viktor Toth presented a show at Marwah Studios,” said Dr. Sandeep Marwah President of Marwah Studios. 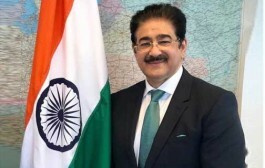 “We feel Marwah Studios as the extension of our Hungarian Information and Cultural Centre. Without efforts we get to perform with ready audience. I am thankful to Dr. Marwah for his unconditional support,” said Dr. Zoltán Wilhelm. Cultural Counsellor and Director of Balassi Institute Hungarian Information and Cultural Centre. 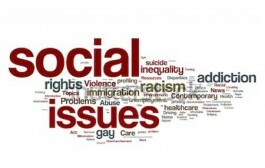 “ I am amazed by the arrangements in such a short period of time and the receptive audience. A film school with students of performing arts means something,” expressed Viktor Toth the artist of the day. Viktor Tóth, alto saxophonist, composer and orchestra leader, has been awarded Jazz Musician of the Year several times. He is One of the top figures of the young generation of the contemporary Hungarian jazz scene. 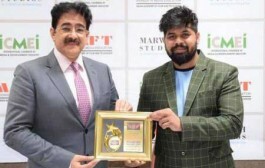 Later Sandeep Marwah honored and presented Viktor Toth a life membership of International Film And Television Club of Asian Academy of Film And Television. Dr. Deepak Narwal from London UK was also present there.